Loosely based on Berri’s own experience during WWII, the film follows the adventures of a young Jewish boy named Claude (Alain Cohen). Despite all of the pleas from his parents, Claude is terrible at staying hidden while living in the city with his parents. Worried that they will be discovered and sent to camps, Claude’s parents secretly send him to live in the country with a name that sounds more French. Ironically, the Catholic family he is sent to live with have anti-Semitic beliefs. While this could have been an element of tension or suspense, in The Two of Us it is instead an opportunity for humor as the young child plays with their prejudices. The person Claude grows closest to is Pépé (Michel Simon), a grandfatherly old man with more misguided beliefs than the rest. But Claude’s childlike innocence allows him to see past these shortcomings, and the two build a strong friendship together, even if some of that time is spent discussing the problems with the religious group that Claude secretly belongs to. Along with teaching him his theories about Jewish people, Pépé shares his other life beliefs with the young boy. They are an unlikely pair, which is where much of the film’s charms come from. On top of Claude’s relationship with Pépé, he deals with the local bullies, a schoolteacher with a penchant for cutting the students’ hair for health reasons as well as punishment, and a crush on the little girl of a local farmer. Even with all of these minor sub-plots, much of The Two of Us is episodic in nature, rather than containing a narrative with a more typical arc. 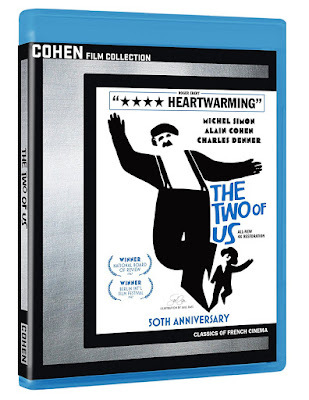 The 50th Anniversary Blu-ray release of The Two of Us contains an all-new 4K restoration of the movie, along with a handful of new special features. This release comes on the heels of last year’s re-release of the film, a trailer for which is included in the extras. There is also a feature-length commentary track with film critic Wade Major.